The center fielder did it all in a 10-5 victory over St. Louis and said he feels glad to be healthy and back on the diamond. FORT MYERS, Fla. (AP) — Grady Sizemore had three hits, scored three runs and showed a good glove in the outfield, helping the Boston Red Sox beat the St. Louis Cardinals 10-5 Monday. An AL All-Star in each of his last three full seasons (2006-08), Sizemore has been hampered by injuries over the last five years and missed the past two seasons following operations on his right knee and back. “I’m just happy to be healthy and be out there playing and being able to do those things, and hopefully build off that,” Sizemore said. Sizemore, signed in January to a $750,000, one-year contract, ended the first inning when he crashed into the center-field wall to rob Daniel Descalso of an extra-base hit. In the eighth, sprinting back and to his right, Sizemore made a diving catch at the warning track to nab Jon Jay’s sinking fly ball. 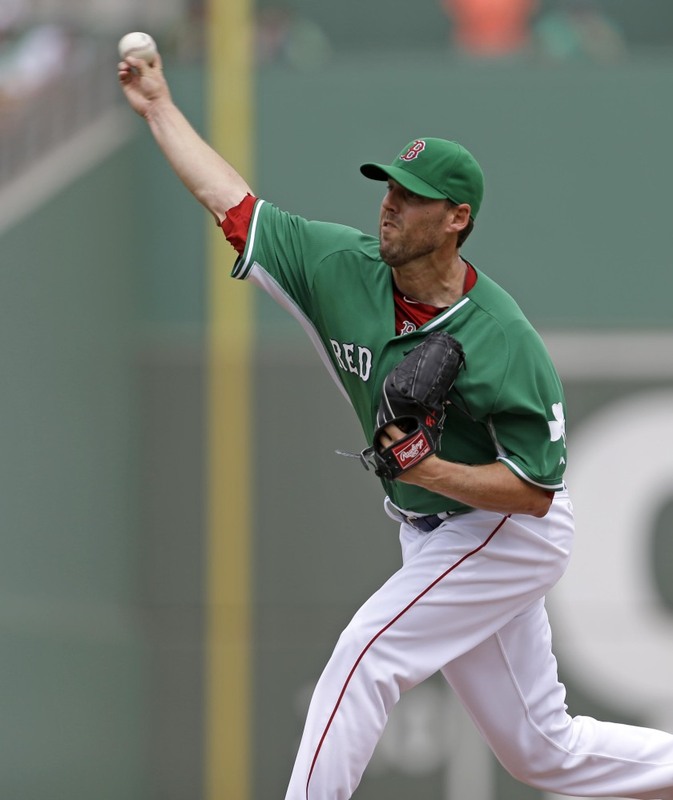 Boston starter John Lackey gave up five runs, six hits and two walks in five innings with three strikeouts. Cardinals starter Shelby Miller gave up three runs, three hits and three walks in 3 2-3 innings. To celebrate St. Patrick’s Day, the Red Sox and Cardinals played with green bases, the Red Sox wore green caps and jerseys and the Cardinals wore green caps. STARTING TIME: Despite the numbers, Farrell was satisfied with Lackey’s performance. Miller was working on his secondary pitches. “He was using a lot of different pitches today,” manager Mike Matheny said. “He was using a different philosophy. I know he’s been working on his other pitches and we’ve talked about that all spring — the Catch-22 of getting better with your secondary pitches but also keeping your key pitches as sharp as you want them and the results as good as you want to. Overall, I think he did a good job. We saw some good pitches in tough spots. I think he’d like to see a little more than he had. He was a little frustrated. You’ve got to take all things into consideration with the conditions the way they are. TRAINER’S ROOM: Right-hander Jason Motte, who is coming back from elbow ligament-replacement surgery, faced hitters Monday morning at the Cardinals’ complex. Motte is slated to next face hitters again Friday, which is in line with his original schedule. BACK IN CAMP: Right-hander Pat Neshek returned to Cardinals camp after the birth of his son Thursday and threw in a minor league game. He could pitch in a major league game on Wednesday. Neshek’s son remains in the hospital with some breathing problems. The Cardinals are giving Neshek all the time he needs to deal with his family situation. The first son of Neshek and his wife, Gehrig John Neshek, died 23 hours after his birth in October 2012 because of respiratory complications. Third baseman Will Middlebrooks sat out the game with a hyperextended right middle finger. He is day to day. Left-hander Craig Breslow is scheduled to throw batting practice for the first time on Friday. He is being brought along slowly after an increased workload last season. FOR THE RECORD: Dustin Pedroia went 2 for 4 with two runs scored, three RBIs and his first home run of spring training. Mike Napoli hit a three-run homer in a five-run fifth inning. It was his third home run of spring training. Kolten Wong went 3 for 4 with a double and an RBI for the Cardinals. THIS AND THAT: The Red Sox made their second round of roster moves on Monday. Right-hander Allen Webster and catcher Christian Vazquez were optioned to Triple-A Pawtucket. Shortstop Deven Marrero was reassigned to minor league camp. Boston reassigned left-handers Tim Cooney and Lee Stoppelman and catcher Travis Tartamella to their minor league camp.